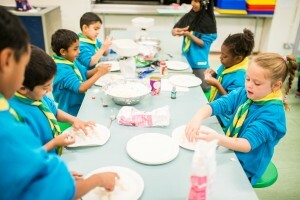 (Sheffield/TSA) – When Sian Bagshaw, Development Officer for the Roma and International Communities of The Scout Association (UK), attended the European Scout Region’s “Diversity and Inclusion Training III” just about a year ago, she may not have thought that she would put into practice newly acquired knowledge and tools so quickly. In fact, earlier this year, a large number of Roma families from Slovakia settled in Sheffield in South Yorkshire (United Kingdom) and soon the local Scout Council decided to open a new Scout Group. The new Group is based at Owler Brook Primary School in the Page Hall area of Sheffield with capacity for some 100 Beavers, Cubs and Scouts. The aim is to get the diverse community to integrate and to offer Scouting to the children and young people of this particular area of the town. And after the first couple of weeks of activities, comments are very encouraging: “The youth of today are the way forward. If we can get children working together, then they are the next generation of adults who will also work together,” says Sian, who is supporting the local volunteer running the new Scout Group.